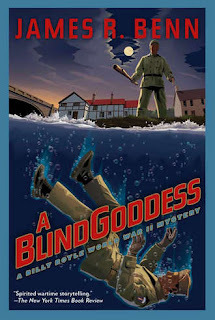 With a stack of standard mysteries here to review over the next week, I'm moving the two compelling "young adult" (YA) titles to one of my other blogs -- bethkanell.blogspot.com -- because I want to probe their relationship to teen readers, and it fits better "over there." 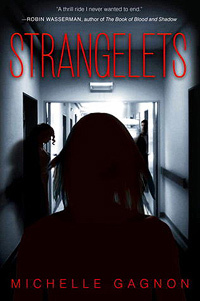 Watch for them this evening: STRANGELETS from Michelle Gagnon, and WHAT WE SAW AT NIGHT from Jacquelyn Mitchard. One of his grown children finds the Ojibwe spiritual path most important; another is committed to becoming a nun. Or is she? Investigator Cork O'Connor walks the uncomfortable parental line of accepting and letting go, trusting his kids, but it's not easy. And it's even harder when, in TAMARACK COUNTY, the attacks of a serial murderer keep coming close to his family. In the northern Minnesota community where Cork is now officially not a cop, but still tied in with them, everyone has connections. The first presumed killing is of a judge's wife -- at least, she's been missing too long in this severe winter region to be alive. The second, a dramatic horror, strikes a friend's beloved dog. Cork's son Stephen may even need to seek a vision, to grasp the evil erupting in the close network of friends. Stephen's girlfriend and her mother are among those targeted, and Cork's getting drawn into all of it. This taut and polished traditional investigative mystery keeps the pace intense, the emotions trembling, and there are fierce questions of love and loyalty throughout. Could love itself be what's compelling the killer? Snowmobile chases, Search and Rescue teams, and threats abound. Stephen's wise Ojibwe mentor, Henry Meloux, comes home to help -- because it's clear there's a majimanidoo, an evil spirit, involved. And Cork is tracking two possible connections to earlier crimes, as well. 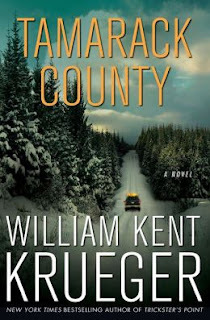 Twelve earlier Cork O'Connor mysteries have created loyal fans of this series, but William Kent Krueger makes it easy to step directly into this one -- no previous reading needed. Cork's search for why this person, and why now, extends to his family and his own heart. The book is a darned good read, a deeply satisfying chase to stop a criminal while honoring the ties that matter most. 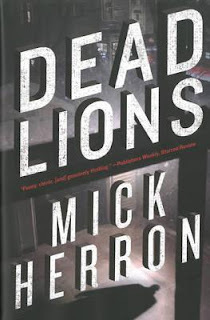 Yes, I know, saying Mick Herron's British MI5 series that's now two books long -- the first was Slow Horses, reviewed here, and the second is this year's DEAD LIONS -- is "gritty espionage with heart" doesn't sound as though it's the opposite of John Le Carré. But I can't fit the rest of the description into the title bar: funny, clever, ironic, poignant, twisted, and populated by a crew of espionage "failures" whose ability to succeed seems almost accidental. Or, more to the point, they succeed as a by-product of their misplaced loyalty toward each other. River studied [Catherine], an old-fashioned creature whose pale colouring spoke of an indoor life. Her clothes covered her wrist to ankle. She wore hats, for god's sake. He guessed she was fifty-ish, and until the business last year he hadn't paid her much attention; there was little in a wall-hugging woman her age to interest an uptight man of his. But when things had turned nasty she hadn't panicked. She'd even pointed a gun at Spider Webb -- as had River. This shared experience made them fellow-members of a select club. But is this new awareness enough to get the Slough Horse crew working together? In fact, if the "real" MI5 finds out that the "Slow Horses" are tracking a potential sleeper cell of former Russians n Britain, they won't be allowed to work at all. Who could expect any success? Well, Jackson Lamb expects it. So, oddly enough, does River, even if he's no longer expert at dealing with things that go right. From the inside-the-group extortionate moments, to the dangers of messing around behind official channels, Herron sets up a dry and wry chuckle every few pages. And sure, farts are juvenile, but Jackson Lamb may, after all, be using them effectively. For a book that opens with a cat, ends with a mouse, and serves up what Spider Webb most deserves, this is also a weirdly realistic espionage romp. 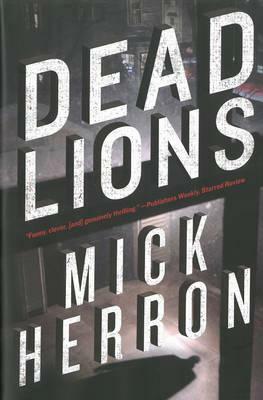 I'd read another Mick Herron in this series any time. I'm hoping they'll keep on coming. This one already made a nomination list for the 2013 Golden Dagger ... 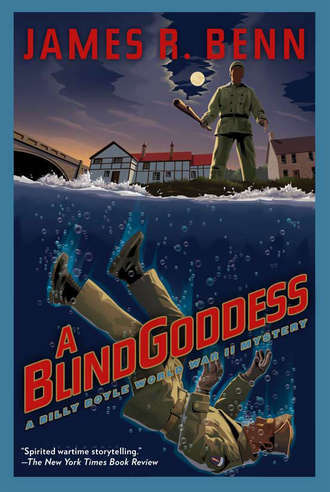 So, while I wait for the next in the series, I plan to check out Herron's other work, the Sarah Tucker/Zoë Boehm books. But I suspect they won't have the same bittersweet humor and tenderness of Slow Horses and Dead Lions ... hmm, I think Herron's approach has me hooked. This week the new Barbara Cleverly title in the Joe Sandilands Investigation series reached publication via Soho Crime -- good news indeed! A SPIDER IN THE CUP is the 11th in the series, and the steady, sane, compassionate character of this inspector, by now Assistant Commissioner, anchors this fast-moving and suspenseful crime novel. It's 1933 in England: a time of recovery from the Great War, and of enthusiastic embrace of the playfulness coming across the Atlantic: madcap dancing, women with short hair and short skirts, and the amazing movie King Kong -- even Joe can quote the movie's famous line spoken over King Kong's dead body: "Oh no, it wasn't the airplanes ... it was Beauty killed the Beast." Joe adds lightly to the line, "A lesson we beasts should take to heart, Bill," as his irritation with former a former colleague rises. Bill Armitage had another name when Joe knew him last, but the man's peculiar mix of capability and betrayal has Joe on edge just as much now as before. And this time, they're supposed to be working together, protecting an American senator attending political talks in England. But Senator Kingstone is a risk taker, as well as a passionate man, and when it appears that his lover has been kidnapped, perhaps tortured, Kingstone and Joe Sandilands struggle to name the perpetrator. An Englishman, probably, from the Shakespearean quote that arrives as a threat -- one to which the senator adds another part of a speech from that political suspense classic, Julius Caesar: "Then I, and you, and all of us fell down, / Whilst bloody treason flourished over us." Significantly, the conference Kingstone is attending, where he's struggling to grasp and affect relationships among European leaders, is also starting to confront the possibility of a second German power rising from the ashes of the previous war. This ominous shadow is as present as the evil that's sparking the crimes Sandilands confronts. 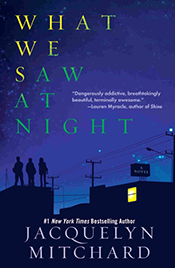 Cleverly, as in her other 10 books in this series, adroitly paints the temper of the times as backdrop to her detection drama. Treason seems all too likely. You don't need to read any of the other books in the series before this one -- it has few connections to the preceding volume. But readers who are already fond of Joe's loyal family members and their "very English" lives can expect some delights, as Joe takes steps to keep Kingstone safe, then lays an old-fashioned trap of his own for the international criminals on his track. 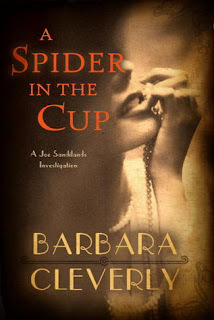 Agatha Christie fans, Jacqueline Winspear readers, and those following one or both of the Charles Todd series may also find A SPIDER IN THE CUP deeply satisfying. 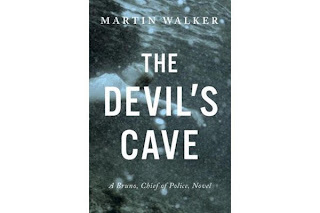 Cleverly's books are among the ones I look forward to each year, knowing I'll get a good read with believable twists and suspense, and an investigator whose character inspires me to be a bit braver, more committed, and more effective. If you can't fit this one into your summer reading, I hope you add it to the stack by the reading chair, for intrigue and adventure in the weeks ahead. One of the biggest topics among authors is suddenly Promotion -- a task that the fortunate used to delegate to their publishers. Now everyone is expected to work at this, and even create the plans for it. I've read some agonized author rants recently where people have talked about how uncomfortable they are with the effort and the public face that's needed. Some are even threatening to stop writing! 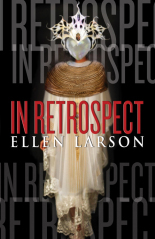 Taking a different and quite lovely path this year has been Ellen Larson, author of the sci-fi mystery crossover IN RETROSPECT, which will be released in December. With a long-term plan, Ellen started work early this year to develop and have created a work-of-art book trailer. In the process, she learned how to "crowdsource" via Kickstarter. I think her postmortem of the Kickstarter experience is fascinating: click here for her Kickstarter story. If you'd rather skip her words and just see the elegant and haunting trailer, check it out on YouTube. And finally, here's a link to preorder the book from FiveStar, via that notorious online retailer that makes it so easy for all of us to instantly get gratification. I hope there will be many an independent bookstore carrying the book as the release date approaches! Last but not least, a reminder of why mystery readers and writers may have an extra incentive to follow Larson's writing career: Her other "hat" is as editor of Poisoned Pen Press's new "young adult" mystery imprint, The Poisoned Pencil.